We were thrilled with the number of our authors who stopped by the booth during the show, old friends of Hal Leonard and brand new authors alike. Moses Avalon, Steve Gordon, and Bobby Owsinski all had book signings in the booth. More photos can be found in our Facebook album. 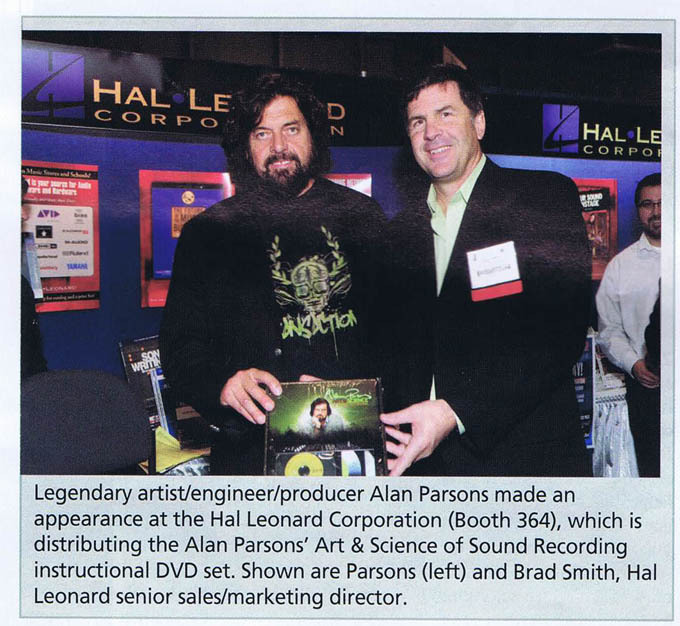 On Friday, Alan Parsons came to the booth to sign copies of Alan Parson’s Art & Science of Sound Recording for fans. The AES Daily took this photo, which appeared in the Daily the next day. 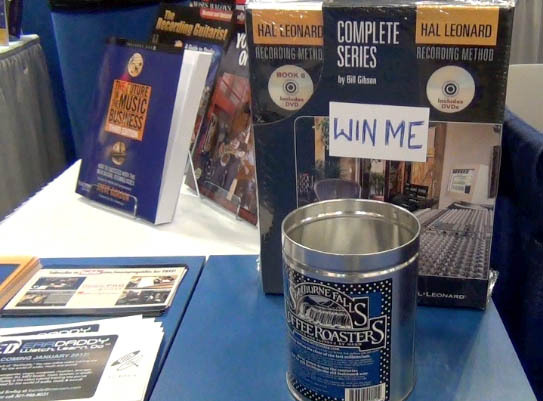 Congratulations to Noemi, who won the raffle for the complete set of the Hal Leonard Recording Method! We also ran a drawing for free books on our Youtube channel. If you subscribe by Oct. 26th, you’ll be entered into the drawing. We demo-ed EarDaddy.com on the television in our booth. Watch for this brand new video tutorial site in January 2012! The six-volume Hal Leonard Recording Method, the world’s first and best-selling recording method that takes the aspiring professional from the beginning of the signal path to the final master mix, has been revised and updated with the release of the second editions. The series provides easy-to-understand explanations of the entire recording process, addressing both standard equipment and the latest software and technology; hundreds of photographs and illustrations; and much more. These new editions feature free downloads of dozens of audio and video examples that amplify the material taught in the books. “This will fast become the norm with all of our products that traditionally come with CD or DVD content, making access to them easy and downloadable directly to your preferred media player,” says Bill Gibson, author and Music Pro Guide series editor for Hal Leonard. The entire Hal Leonard Recording Method will be available at the Hal Leonard booth (#364) at the Audio Engineering Society Convention to be held Oct. 21-23 at the Javits Center in New York. The updated Book 2 will also be available. Visitors to the Hal Leonard booth will be able to enter a drawing for a chance to win the complete six-book set. The drawing will take place Sunday, Oct. 23, at 1 p.m. Explanations of the most up-to-date tools and techniques involved in using dynamics and effects processors. Book 2, Instrument & Vocal Recording, 2nd Edition ($39.99), addresses new equipment and software concerns that affect the way excellent recordings are made. Updated text, illustrations, photos, and video examples add to the power of the earlier edition, and new techniques and considerations are presented as they pertain to additional recording scenarios. Readers will learn what they will need to know about capturing the best vocal and instrumental tracks possible, no matter the studio or equipment in it. The other books in the Hal Leonard Recording Method also are being updated and revised and will be released in this order over the next six months: Book 3 Recording Software & Plug-Ins, Book 6 Mixing and Mastering, Book 4 Sequencing Samples & Loops, and Book 5 Engineering and Producing. Available for purchase here from Hal Leonard Books.